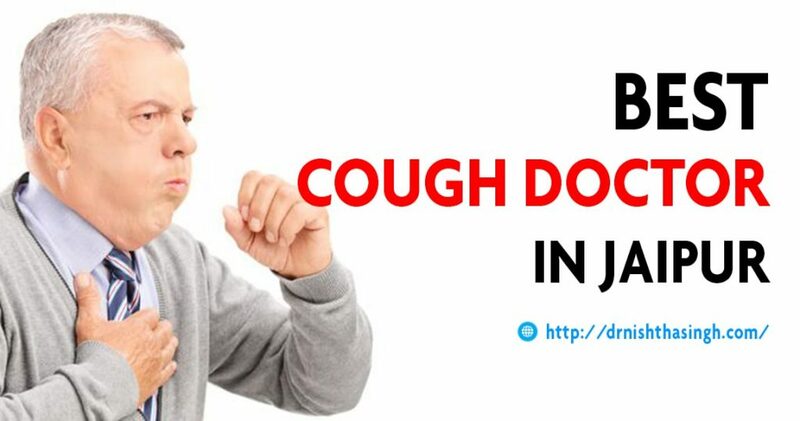 Best Cough Doctor in Jaipur: A cough, also pronounced as tussis, is an automatic and voluntary action that cleans the breathing passage and throat of foreign particles, mucus, fluids, microbes and irritants; it is a fast expulsion of air from the lungs. Coughing can be done as part of reflex or deliberately. Although cough may be a serious sign of illness, more often, it will be automatically clear up without the requirement for medical attention. Dr Nishtha is one of the Best Cough Doctor in Jaipur, She provides Best Cough Treatment in Jaipur, Rajasthan. In this article, we will include all the possible causes, diagnosis and treatment for coughs. Home remedies can soothe many types of coughs. If the diagnose of cough is difficult, then the chest X-ray may be required. A few types of cough only occur at night. To spread to new hosts, some germs use coughing. If anyone coughs continuously, then it may be a sign of a disease. Majority coughs are caused by infection diseases, such as common cold, but there are also various non- infection causes. A periodic cough is usual and even it helps to remove unfamiliar substances known as antigen and prevents infections. But the situation becomes serious when the patient suffers from this problem for the week. This is the situation when you need to contact the doctor immediately. Dr Nishtha is the Best Cough Doctor in Jaipur, She has years of experience and offers Best Cough Treatment in Jaipur. Postnasal drip: when your sinuses or nose produce excess mucus, this is the condition of upper airway cough syndrome. Gastroesophageal Reflux Disease (GERD): in this situation, there is a tube connected between the throat and stomach, so the stomach acid flows in the reverse direction in the tube. In starting stage patient feels the continuous irritation and after some time it converted in chronic coughing. For more details or any query visit www.drnishthasingh.com. Asthma: There are various types of asthma, but in the one case known as cough-variant asthma, a cough is the major symptoms. It becomes worse when you come in contact with certain chemicals, fragrances or cold air. According to research, the causes described in the above section are the 90 percent responsible for chronic coughs. If you have a cough that remains for several weeks and affecting your work or disturbing your sleep it means, you need to immediately consult with a doctor. In our hospital, we have the Best Cough Doctor in Jaipur.